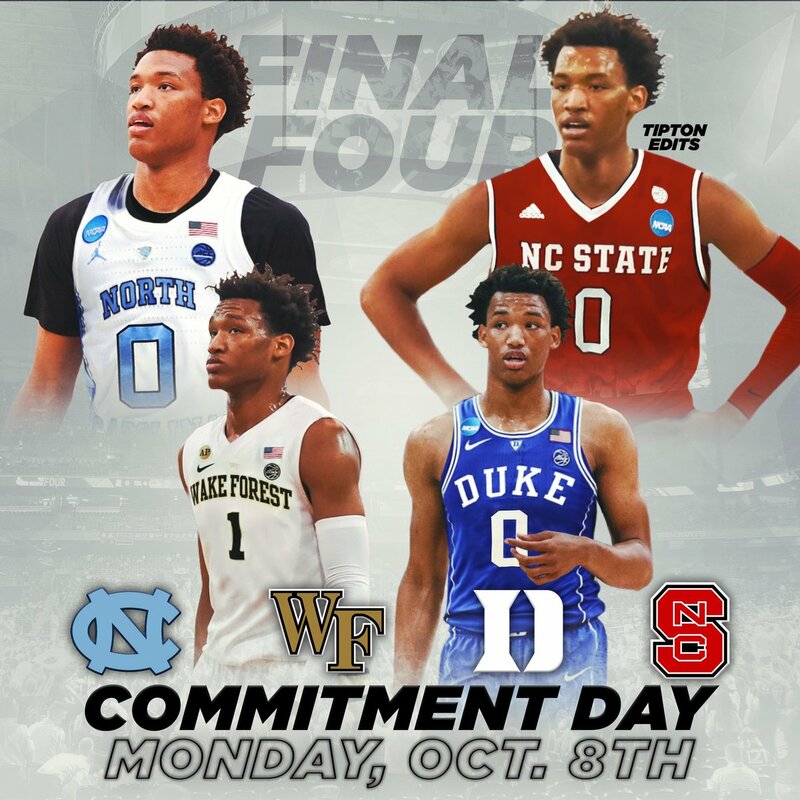 Key Duke Basketball prospect Wendell Moore Jr. announced his final four schools this afternoon and will choose his collegiate hoops destination this coming Monday. Moore is a five-star prospect from Concord, N.C. and a player the Blue Devils staff has coveted for a long time. Chris Carrawell has been the lead assistant recruiter for the Blue Devils and Mike Kryzyzewski has been heavily involved. 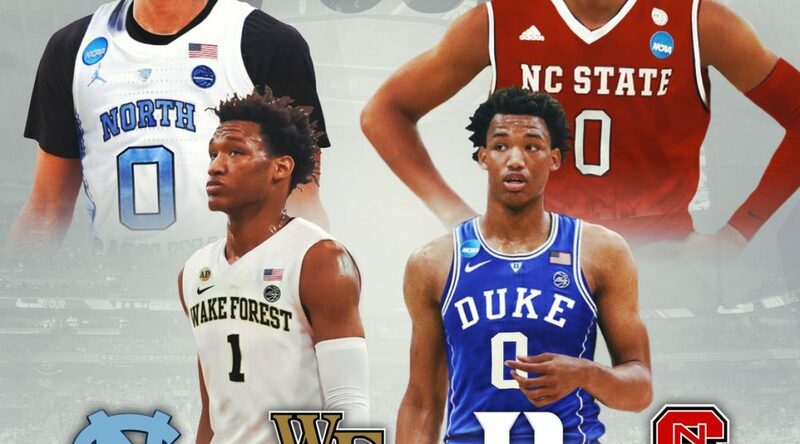 The Cox Mill product would likely start for the Blue Devils where they expect to lose up to four players to the NBA Draft. Moore is 6-5, 215 and can play multiple positions. He is also being heavily recruited by N.C. State and has North Carolina and Wake Forest on his list. For more information on Moore, join Blue Devil Nation Premium during our special offer of 60.00 for one year's coverage. You can find our analysis on the situation there. Blue Devil Nation PremiumDuke Basketball Recruiting NewsWendell Moore Jr.
Who is in group is making the cut for being a serious target? 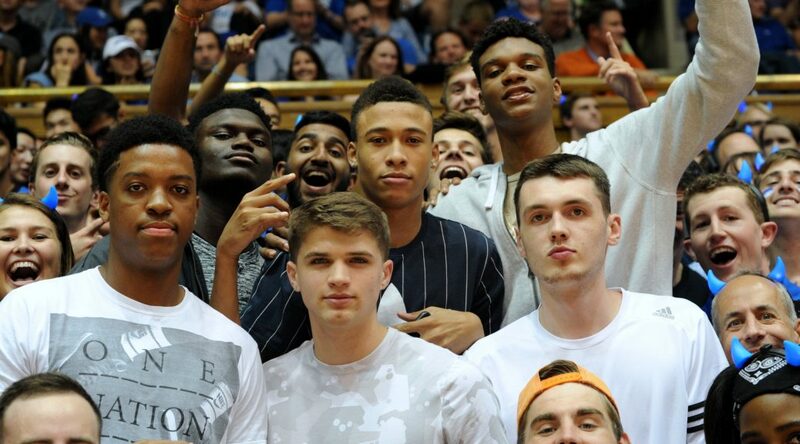 The Duke Men's Basketball staff has been working with the star-studded incoming freshman class and their returning players while preparing for their trip to Canada. Before that trip takes place and the ten allotted practices begin the staff will be out to several recruiting events starting Thursday, including the Nike Peach Jam. In our latest update for Blue Devil Nation members, we take a look at who they will look at and how the recruiting class is shaping up as well as updates on next seasons team. New names could be in play and there may be interest in players some think they've move on from. Check out the latest by taking advantage of our membership special where we are offering two years for the price of one for interested subscribers. Go to membership options on the front page for the special. Our latest update for members is on the message board. If you are a member having trouble accessing the message board, contact us. 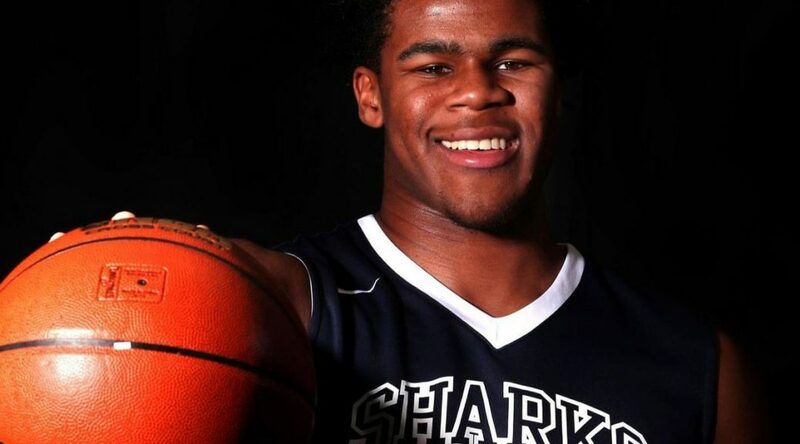 One of the best sure-fire big man prospects in the nation is Vernon Carey. The scary thing is that the young man is just starting to reach his potential. Carey is considered a can't miss one and done prospect and he has the nations blue blood programs listed in his final five schools. Duke has stayed in touch with the Florida prospect where he regularly talks to Mike Krzyzewski and the Duke assistant coaches. While some believe Duke to be the leader for his services, other schools continue to push hard as well. The Blue Devils will be in dire need of big men next season with the expected departure of Marques Bolden. They continue to give maximum effort with concern to Carey and would like to team him with another bug man. The last time I spoke to you was in Raleigh during the John Wall Invitational. Talk about how your game has changed since that time. I am just trying to be more aggressive over the high school season and then to this summer. Just working on my game every week. What do you do during the week and who do you train with? I do it with one of the NBA trainers, Stan Remy and I workout with Dwayne Wade and Brandon Knight. Wow, that is impressive. You have that down home Florida thing going on. So, your final five per twitter is Duke, Kentucky North Carolina, Miami (FL), and Michigan State. Can you touch on who has been the most active of late in your recruitment? Miami, they text me everyday and say I can bring a legacy to Miami. Coach Nate James and Mike Krzyzewski (knows how to pronounce it) texts me everyday to and says that I am a guy who can help lead the Duke program. How did Duke say that they can use you in their system? Yeah, like one and done guys like Marvin Bagley and those guys who played this year and are going to the NBA. Is that an attractive situation for you? When you get down to making a decision, is there any timeline on that or is it still early? It's early, but I am trying to do it before high school season next year. I would like to make a decision by then, but I am not sure yet. Vernon, being a highly rated player like you are guys will come after you hard. Who are some of the toughest competitors you have face on the circuit? 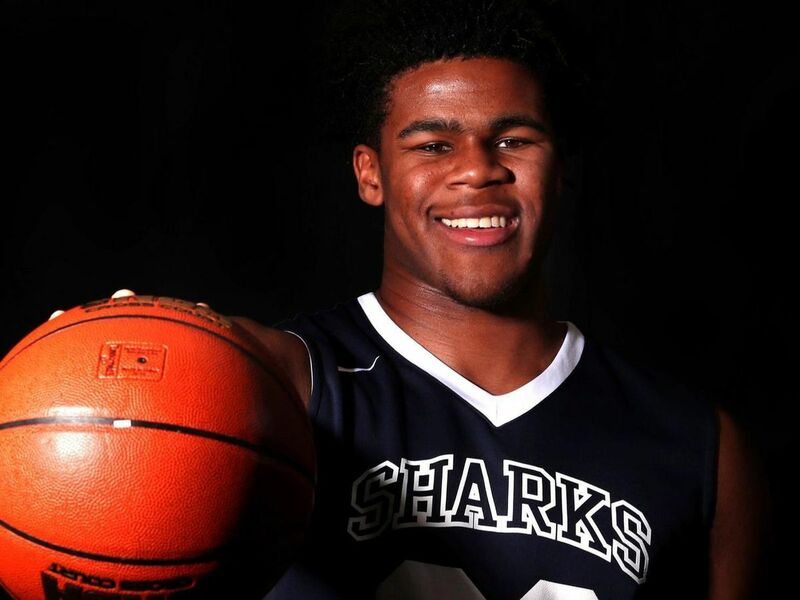 Guys like Keion Brooks (Mich. St. may lead IU and Kentucky) and really everybody. They're all coming at me hard. Do you have an unofficial visits planned? Maybe Miami, but just because they are close to home. Just how far are you from the Miami campus? Maybe thirty or forty minutes. Yeah, that is close. Is that an advantage for them? Some, but I will go where I feel like there is the best fit. Who do you like in the NBA playoffs? Do you pattern your game after any particular NBA guys? I would say DeMarcus Cousins and Anthony Davis. I like to watch them and how they play. What do you hope to accomplish during your coming high school season? Will you be attending the same high school, University School this season? Okay. Thanks for your time and good luck the rest of the summer and the upcoming Peach Jam. E.J. Montgomery is one of the top prospects left on the board. He will visit Duke for the Virginia Tech game. Despite a class which is destined to be the best in the nation, the Duke Blue Devils are not done with recruiting. Enter the hopes of landing E.J. Montgomery. The top player on the Blue Devils wish list is E.J. Montgomery, a power forward who plays for Wheeler High School in Marietta (Ga.). The five-star prospect had committed early to Auburn but reopened his recruitment. 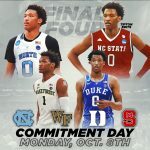 Standing 6-10 and weighing in at 200 pounds, Montgomery could make up for the size Duke will lose in NBA bound stars Marvin Bagley III and Wendell Carter Jr.
Montgomery has a long list of suitors which includes Kentucky, North Carolina and UCLA. He has been selected to the McDonald's All American game which features the nations elite players. Montgomery is long and athletic with a goo understanding of the game. He can play the high post or mix it up inside. He can take the ball to the rack with authority and continues to develop his outside shot. He can feel the stretch role at Duke or be a mainstay in the front court. His ability to score with his back to the basket or facing it would bode well for the rising star. Here is E.J. Montgomery's profile from ESPN.com. 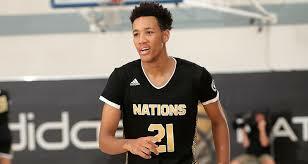 His family will be in to visit Duke for the home game against Virginia Tech which is scheduled for February 14th. 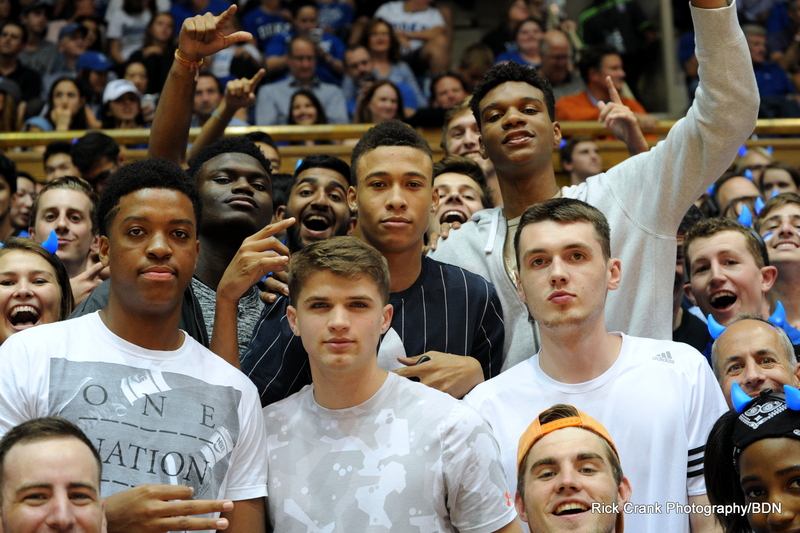 Team Williamson was in the stands for the Duke vs Virginia game this past weekend. Zion Williamson was able to see more of the Duke campus and the facilities with members of his family. 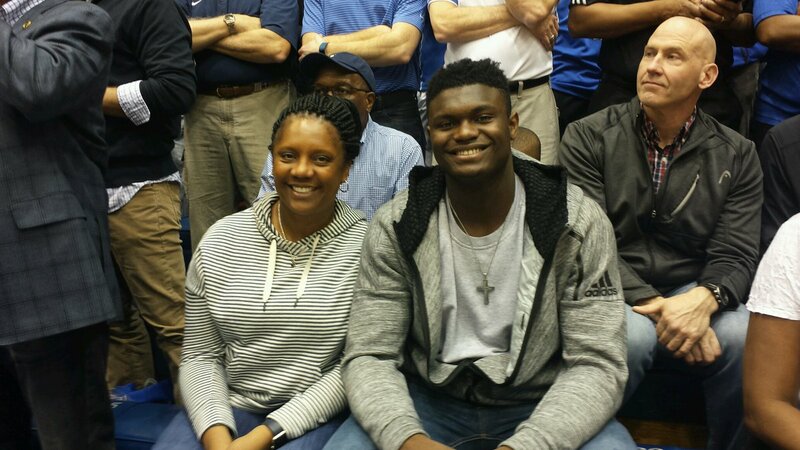 Flanked by his mom Sharonda Sampson, they sat behind the Duke bench. Be sure to check out the documentary below which is sure to get you excited while allowing you to the the character of the Blue Devil to be. 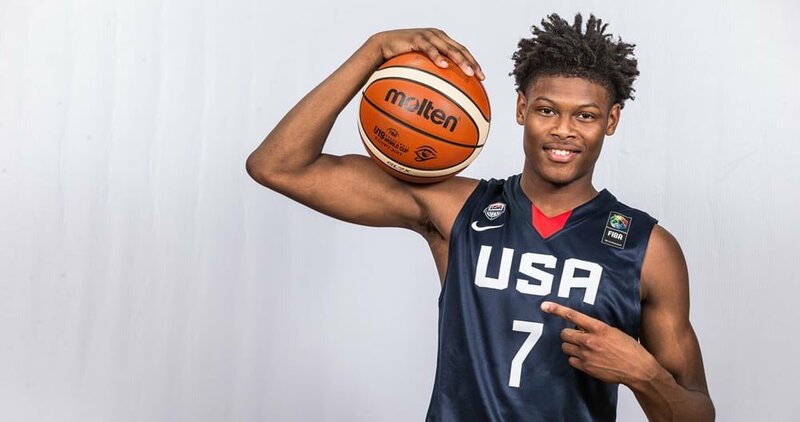 Cameron Reddish will be in a Duke uniform next season. Watch Cameron Reddish go off for 53 points at the National Hoopfest from our friends at Slam.